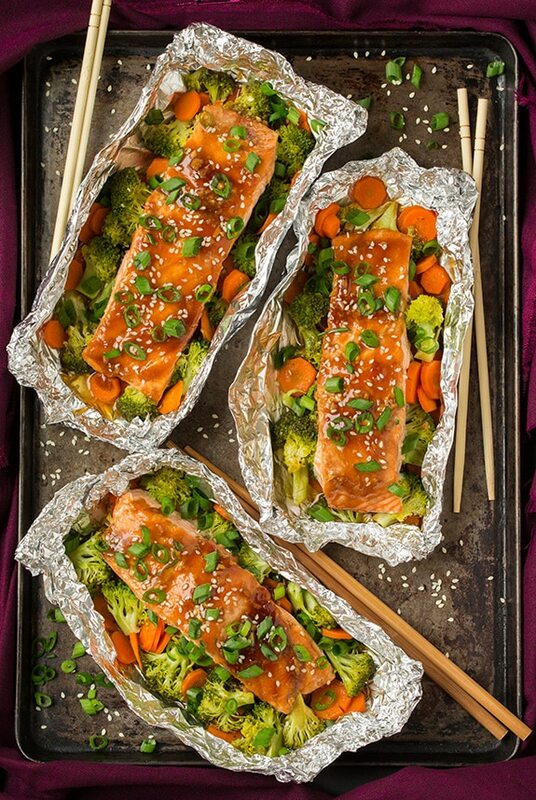 Who doesn’t love a good salmon in foil recipe, especially when you can add veggies in along with it? This is the third one I’ve posted within a number of weeks and once you try them you’ll see why! 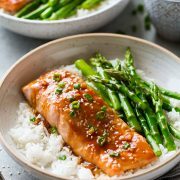 They are easy to prepare and they are a smart dinner choice (the previous three I have posted are the Salmon and Summer Veggies in Foil, Pesto Salmon and Italian Veggies in Foil, then last year I posted a Salmon and Asparagus in Foil). 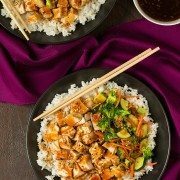 This one has delicious Asian inspired flavors, similar to a chicken teriyaki stir fry but with more of a honey flavor to it. 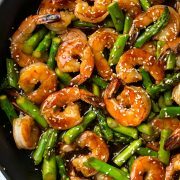 Serve it with a side of brown rice and you’ve got a nutritious dinner that your whole family will love! Want to make it even easier? You can cheat here and go with a store bought teriyaki sauce, I won’t judge. But, I will tell you if you have the time fresh, homemade teriyaki sauce is always better and it’s also good because you can use honey instead of high fructose corn syrup (found in many of the store bought sauces) and you can control the salt content (some of them are a little too salty for me). Everyone in my family loved this salmon, I know it’s a dinner we’ll be wanting frequently. I hope you love it too! 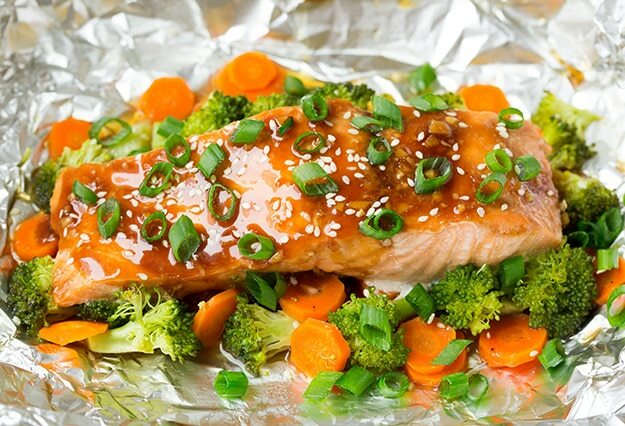 A delicious Asian salmon recipe everyone will love! 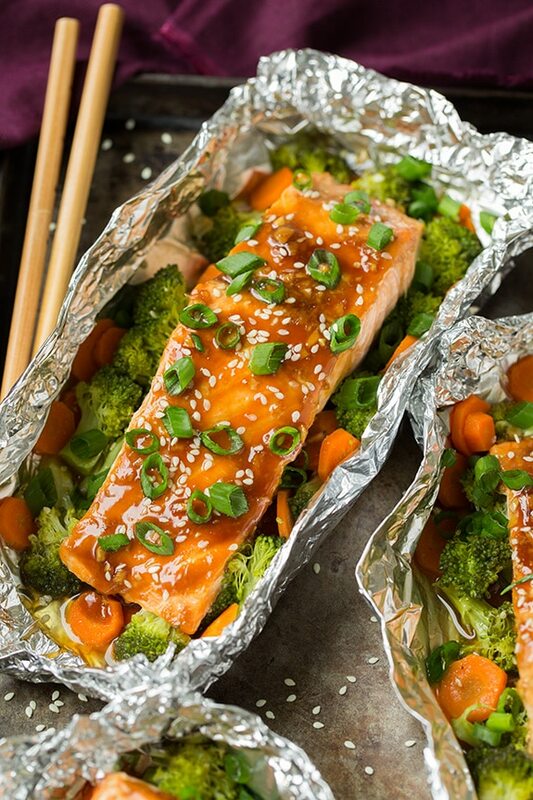 Salmon fillets are coated with a flavorful sweet and salty teriyaki sauce and baked in foil packets alongside fresh vegetables. So good you'll want to add this to the recipe collection! In a small saucepan whisk together soy sauce, 3 Tbsp water, honey, rice vinegar, garlic, ginger and sesame oil. Season lightly with salt as needed. Bring to a boil over medium-high heat. In a small bowl whisk together cornstarch with remaining 2 Tbsp water until well combined. Pour into sauce mixture, reduce to medium and allow to boil 1 minute while stirring constantly. Remove from heat and let cool slightly, about 5 - 10 minutes. 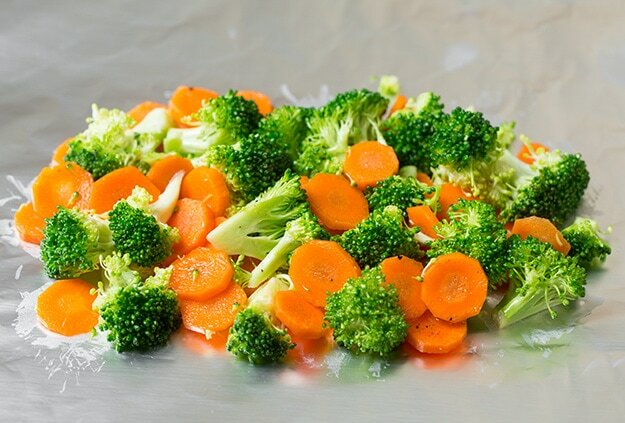 Toss broccoli and carrots with olive oil and season with salt and pepper. Cut 4 sheets of 14-inch length aluminum foil. Divide broccoli and carrot mixture among sheets layering in center in an even layer. 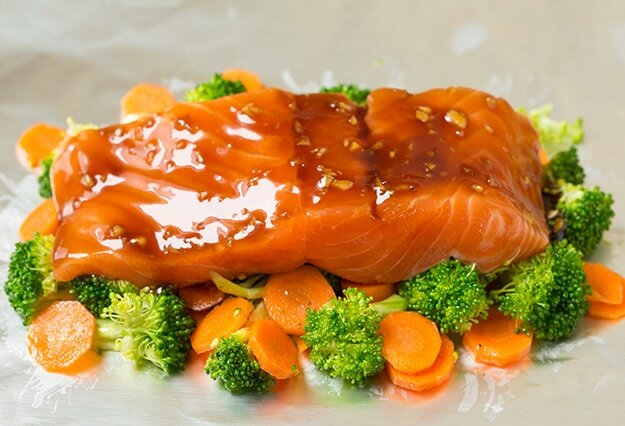 Set aside 1/4 cup of the sauce mixture then brush bottom sides of salmon fillets with a scant tablespoon of the sauce then rotate and place salmon over veggies. Brush tops of salmon with another scant tablespoon of the sauce mixture. 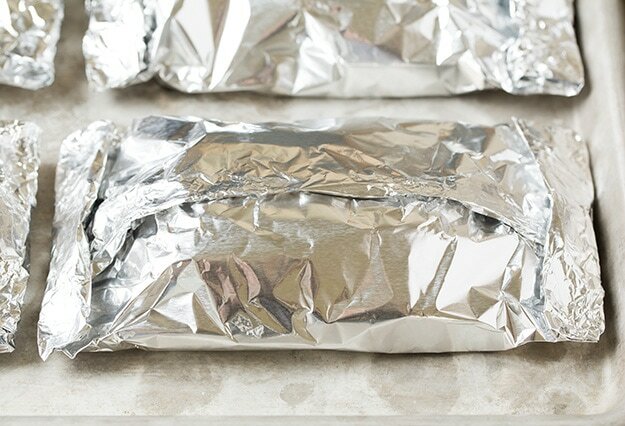 Pull sides of foil inward (the short length) and seal then roll edges up (try to leave a little room for heat to circulate, don't wrap tightly). Place packets on a baking sheet. 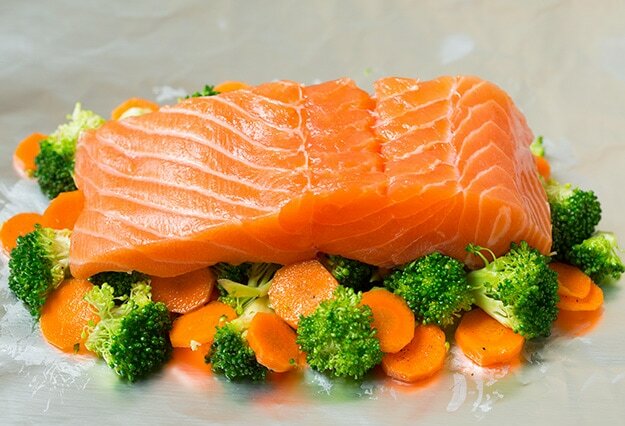 Bake in preheated oven until salmon has cooked through, about 25 minutes. Serve with brown or white rice if desired and remaining sauce. Sprinkle with green onions.